Last week we discussed the impact custom stairs bring to residential interior design. Our next two posts build on the custom stairs discussion, focusing on staircase design for commercial spaces. What style staircase does the commercial space allow? Does the client have inspiration in mind, or are you seeking ideas for the perfect stair to serve as a piece of art in the building? What will set the tone of the commercial space – a unique or monumental stair design? What support is needed in terms of design assistance, 3D renderings and/or turnkey installation? Our team possesses vast experience in enhancing commercial spaces through the design and delivery of commercial stairs. From inspiration to installation, our team has you covered. We will ensure a smooth process for both you and your clients. 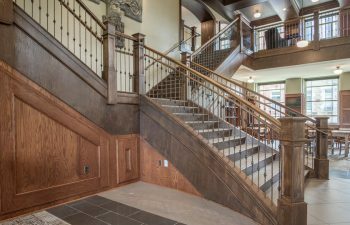 Nationwide, our company has earned its place among the industry’s most trusted providers in custom stair design. How do we do it? We understand what it takes to deliver high-quality commercial staircases, and we leverage industry knowledge, talent, and experience to ensure each project is completed on time and with complete client satisfaction. Selecting a proven, trusted custom staircase provider is key in preventing delays and other installation challenges. With in-depth knowledge of codes and regulations, our team takes all considerations and constraints into account to guarantee project success. We work collaboratively with architects and general contractors to establish project parameters, then provide value engineering services to balance project costs with aesthetic quality, delivering the perfect staircase for the space and budget. Over the past 30 years, we have earned the finest reputation as trusted professionals – consistently meeting schedules and delivering quality results. Our creative, industry-leading design team specializes in complex, monumental commercial stair designs, and we pride ourselves on our innovative approach. Our experience and knowledge allow us to accept and excel at the most challenging custom stair projects. Our skilled team works to deliver excellence throughout all phases of the build, beginning in the hands of our talented craftsmen, moving to our state-of-the-art manufacturing process, then ending with flawless execution by our installation team. We are proud to serve all 50 states as our accomplished, national team delivers superior custom staircases from coast to coast. Now that you are familiar with our custom stair capabilities, stay tuned. In our next post, Part 2 of our discussion on commercial staircase design, we will be showcasing a beautiful stair designed for a prep school library in Cullman, Alabama. Visit our commercial stairs project gallery for additional details and pictures on our monumental projects. From inspiration to installation our team is committed to designing and building the highest quality custom staircases. Our reputation speaks for itself and client satisfaction is our highest priority. Contact us today to discuss your next custom stairs project.